While at Toys R Us, my wife spotted the Sweet Revenge blaster. It ran us about $20, so I’m counting it in the price range to do a review. 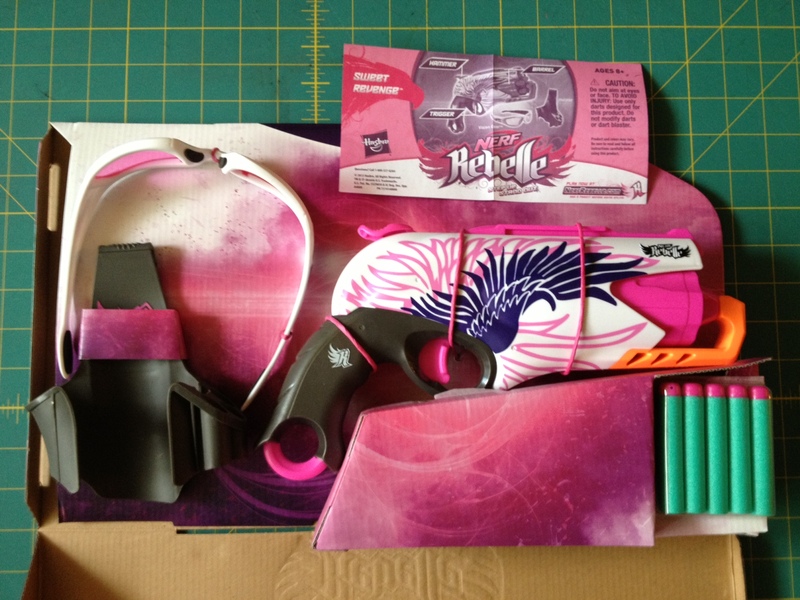 I actually wanted to review the StrongArm next but it was the last one on the shelf, and the first Rebelle that we’ve happened across, so we grabbed it. 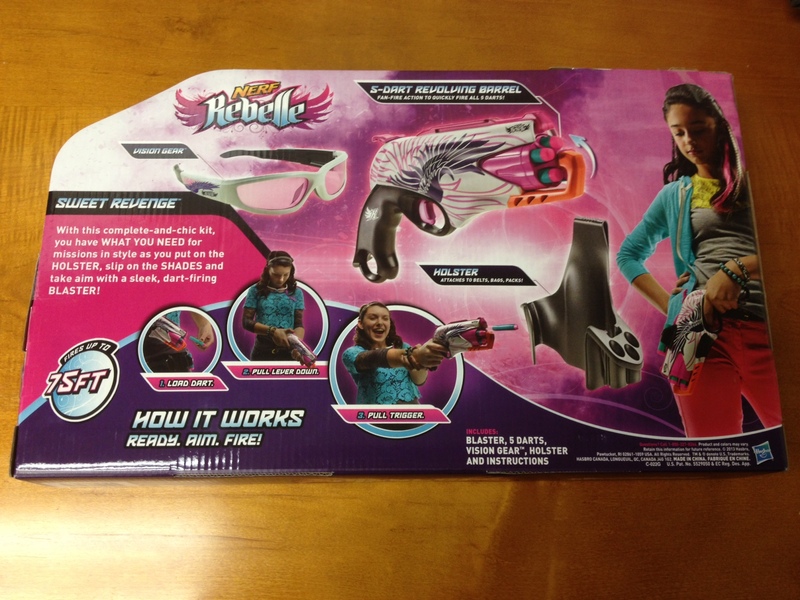 The Rebelle line is not exclusive to any one store, so you could find it anywhere that sells Nerf. In my opinion this is a pretty good buy, but unless you are getting it because of the holster or because it’s Rebelle, the HammerShot is essentially the same blaster for a couple of bucks cheaper. The Sweet Revenge comes in a cardboard package and is tied down with pink string. It will help if you have a knife or scissors to get it open. 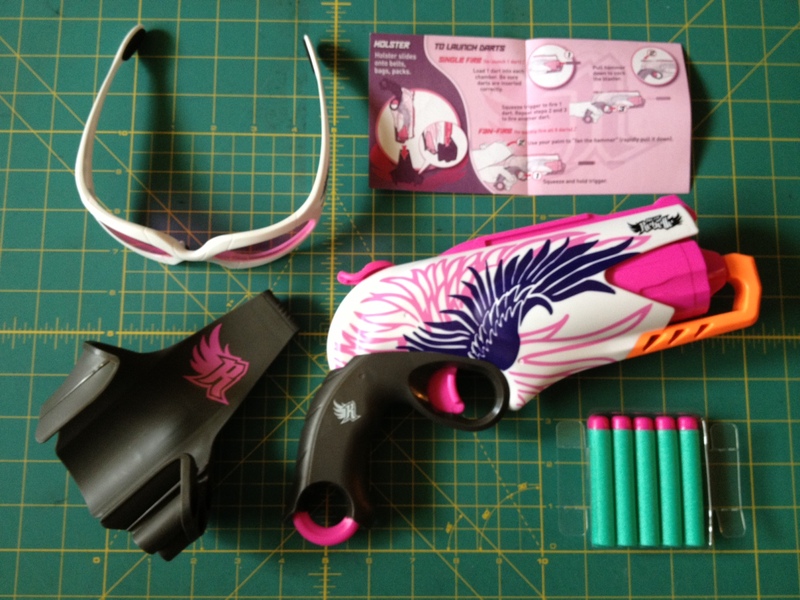 The blaster also comes with instructions, a holster, glasses, and five green (teal) darts that are equal to Elite darts in design. More darts is always better, but taking into consideration return fire. Five darts should be enough for a minor skirmish or two. After that you may have to buy more due to dart wear and loss. The Sweet Revenge is a good-sized revolver with a thin, but long handle compared to a lot of the Elite blasters. Due to its overall size it would require a jacket to conceal it effectively if you aren’t planning on using the holster. It has a much more sleek design than its Zombie Strike brother despite the fact that the internals are essentially identical. To prime your blaster, you pull down the hammer on the back of the blaster until it clicks. If you can do this easily with both of your thumbs, you can actually dual wield a couple of these with no problem at all. 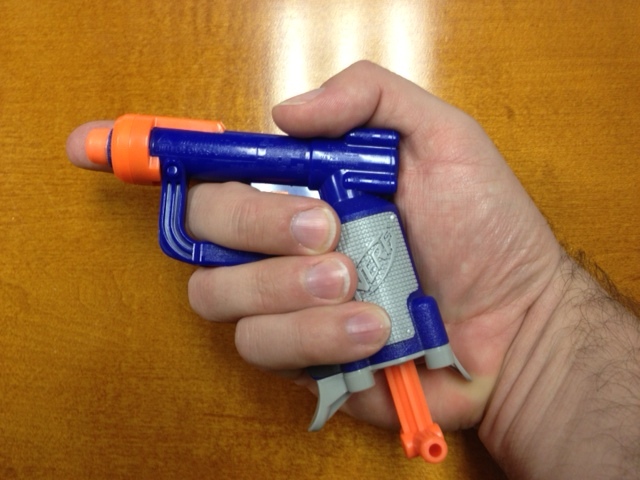 That being said, this blaster is obviously designed for larger hands. Most females that I have talked to have complained about the size of the handle and how difficult the hammer is to reach without using their other hand. The trigger requires about as much pressure as you would expect. 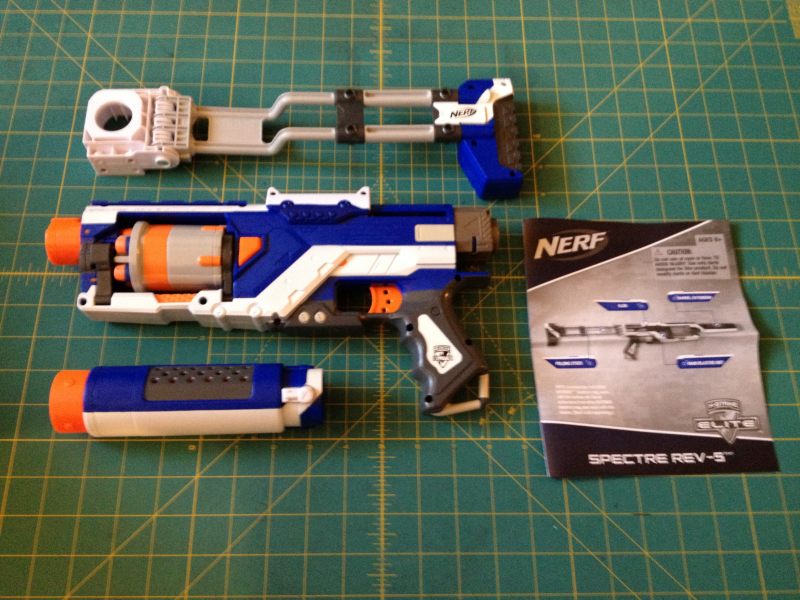 The blaster holds five darts in its rotating cylinder, putting it at a slight disadvantage when compared to the StrongArm (or even the Maverick) in terms of payload. But, considering the new priming mechanism, this may be a fair trade-off if your hands are big enough to prime the blaster one-handed comfortably. Either-way, this gives it a much faster fire rate than any of the single fire blasters. The holster is designed to fit only the Sweet Revenge blaster, which is a shame, but not totally unexpected. The holster is also designed to hold three darts, which actually was unexpected. I can’t be the only person that thinks it’s odd that the holster doesn’t hold five darts. 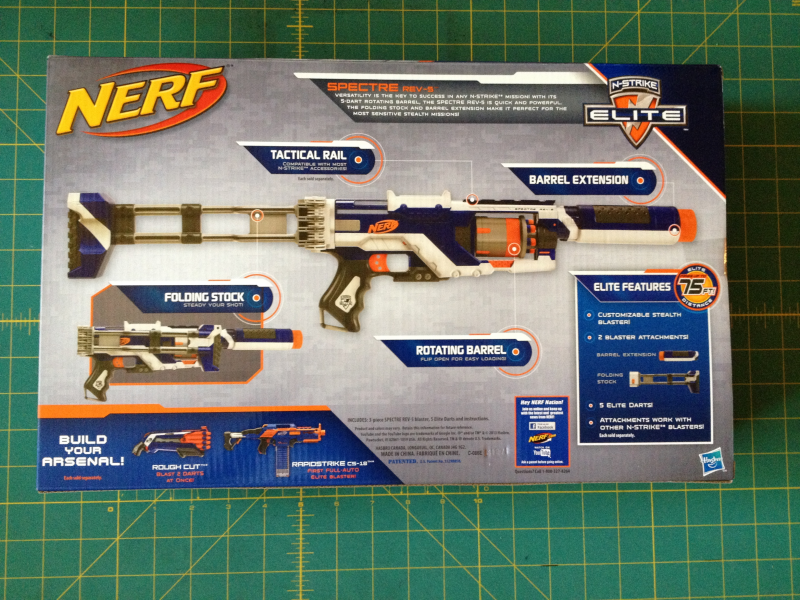 Also, in my experience, Nerf usually gives you enough darts to load your blaster and any add-ons that hold darts as well. This package leaves you three darts shy. What gives Nerf? 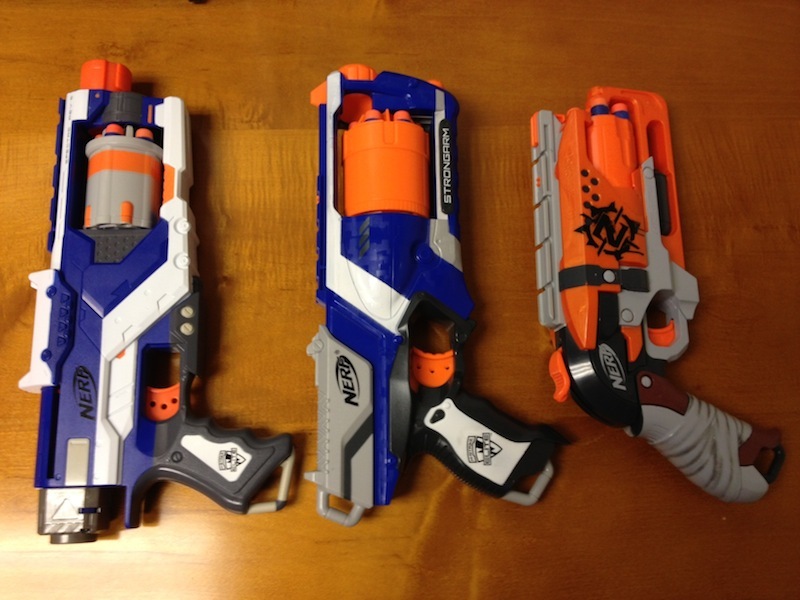 HammerShot, Triad, and Sweet Revenge for comparison. 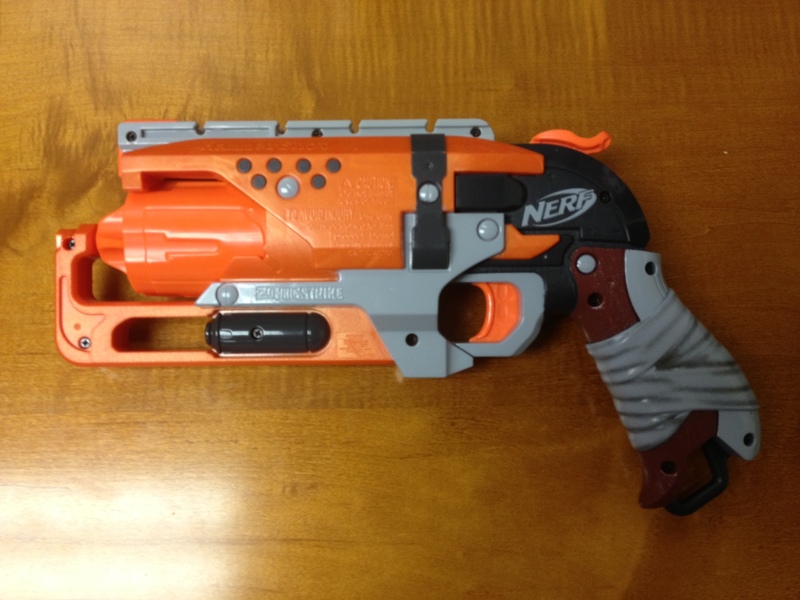 To check out the Sweet Revenge’s brother blaster, take a look at the HammerShot. For a comparison review, check out Foam From Above. While at Target, I picked up a HammerShot for about $15. They are relatively new right now so supplies may be limited. The HammerShot is a Target Exclusive so don’t expect to be able to pick it up just anywhere. In my opinion this is a pretty good buy. It’s not overly expensive, has a tolerable payload, and (usually) can be fired one-handed. 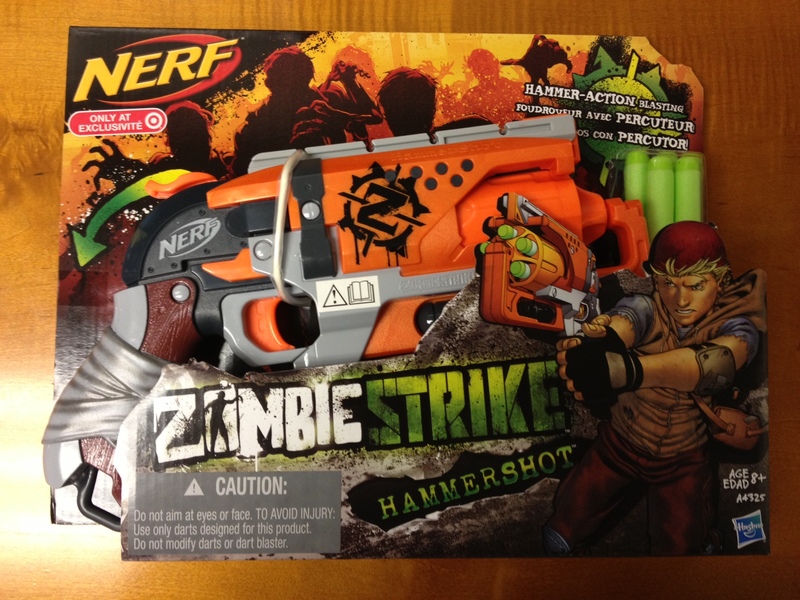 The HammerShot comes in a cardboard package and is tied down with string. It will help if you have a knife or scissors to get it open. 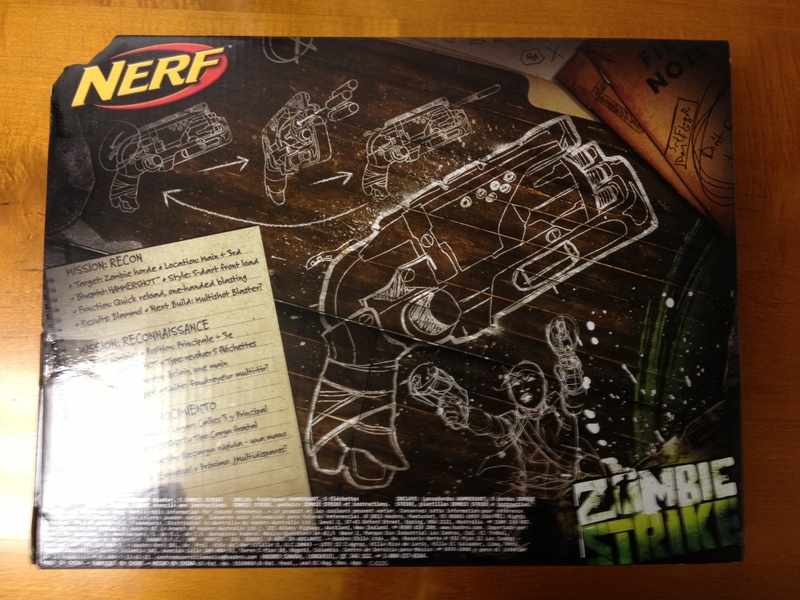 It comes with five green ZombieStrike darts that are equal to Elite darts in design. More darts is always better, but taking into consideration return fire. Five darts should be enough for a minor skirmish or two. After that you may have to buy more due to dart wear and loss. The HammerShot is a good-sized revolver with a beefy handle compared to a lot of the Elite blasters. Due to it’s overall size it would require a jacket to conceal it effectively. 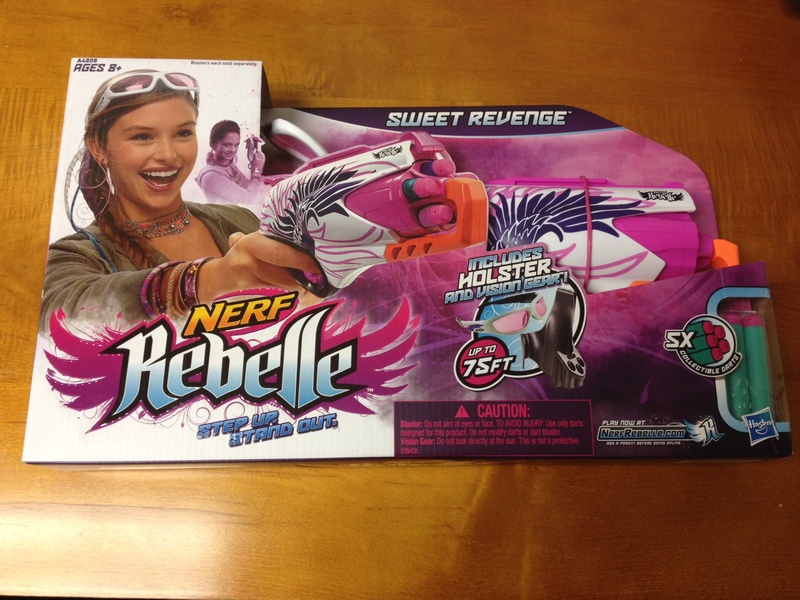 It has a much more boxy shape than the Rebelle Sweet Revenge despite the fact that the internals are essentially identical. To prime your blaster, you pull down the hammer on the back of the blaster until it clicks. If you can do this easily with both of your thumbs, you can actually dual wield a couple of these with no problem at all. That being said, this blaster is obviously designed for larger hands. The trigger requires about as much pressure as you would expect. 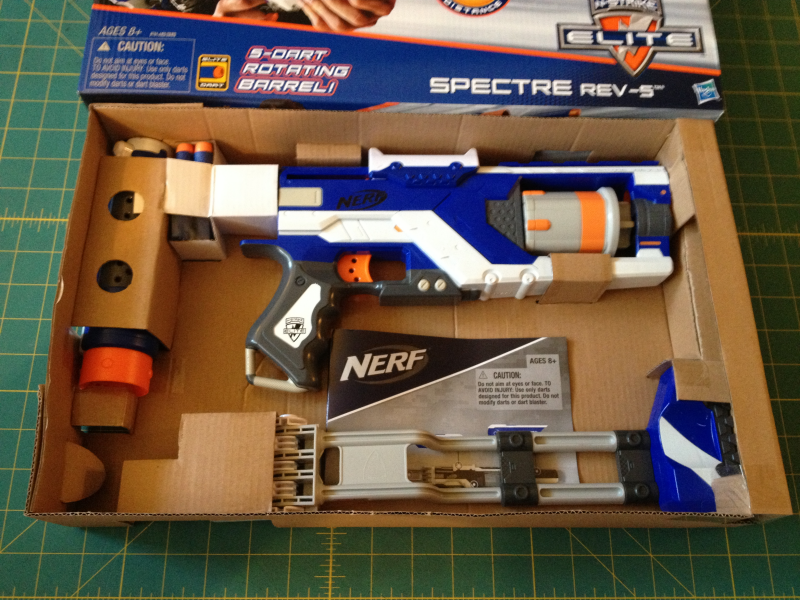 The blaster holds five darts in its rotating cylinder, putting it at a slight disadvantage when compared to the StrongArm (or even the Maverick) in terms of payload. But, considering the new priming mechanism, this may be a fair trade-off if you can prime the HammerShot one-handed comfortably. 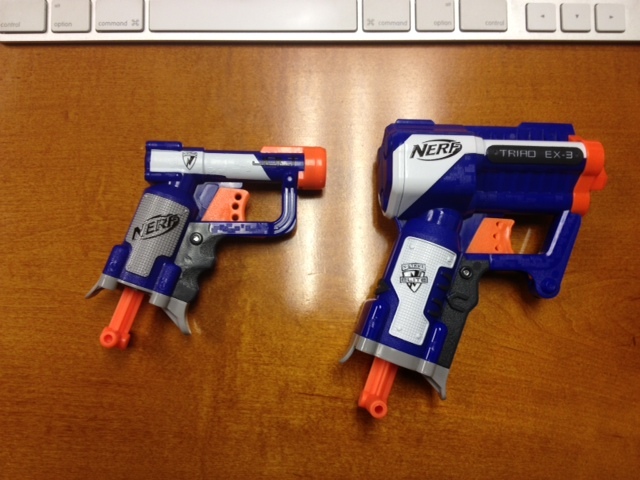 Either-way, this gives it a much faster fire rate than any of the single fire blasters. 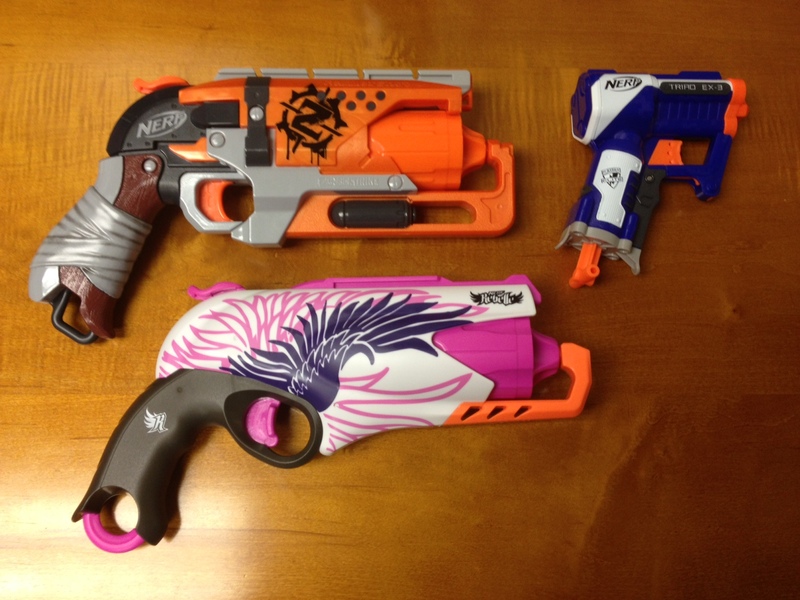 To check out the HammerShot’s sister blaster, take a look at the Sweet Revenge. While at Target, I picked up a Triad for about $7 or so. They have been out for a while and they had quite a few in stock when I was there. The Triad is not an exclusive and can also be picked up at Kmart, Walmart, and Toys R Us stores as well. 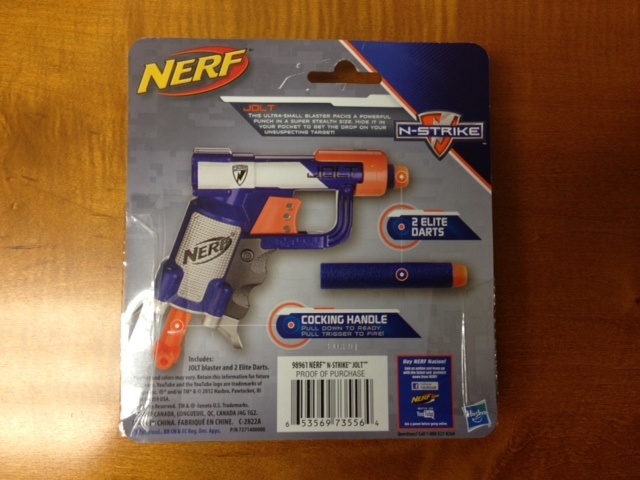 In my opinion, if you are new to Nerf blasters, this is perfect to start with. It’s relatively inexpensive, easily concealable, has a good payload/fire rate, and is easy to use. It is really your biggest bang for your buck. The triad comes in a blister pack that can be opened with minimal effort (easier with a knife or scissors) and comes with three Elite darts. If your office doesn’t have an ammo dump of darts to borrow from, I recommend that you purchase a small package of extra Elite or Whistler darts. Three darts will not be enough for a sustained firefight. The more darts the better, but even a refill pack of 12 Elite darts will only set you back five or six bucks and it’s a lot better than cowering in your cube after three shots, waiting for someone to return fire. 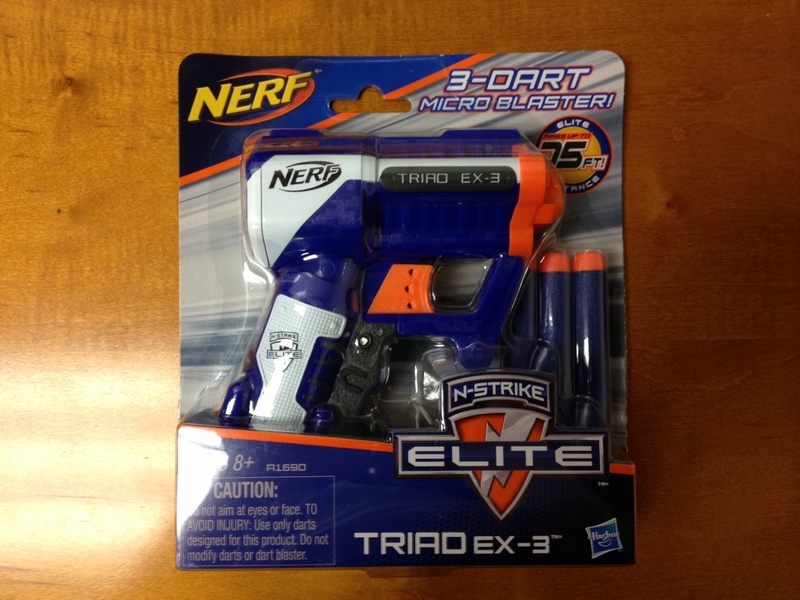 The Triad is one of the smaller of the Nerf brand blasters on the market but not as small as the palm-able Jolt. It can fit in a good-sized pocket or, if necessary, behind your back. It is compact, but not uncomfortably so for my average-sized hands. Jolt EX1 with Triad EX-3 for size comparison. FireStrike with Triad EX-3 for size comparison. To prime your blaster, just pull down cocking handle at the base of the blaster until it clicks and you are good to go. The trigger requires about as much pressure as you would expect. Now, this is where the Triad truly stands out. The blaster holds three darts fully loaded, but only fires one dart per prime. This gives you a much faster fire rate than the single fire blasters like the Jolt and FireStrike. Although it’s ammo capacity is still noticeably less than most Nerf blasters on the market, like the revolvers and clip-fed blasters. So, you will still have to watch your ammo consumption during battles. Not that I felt like I personally needed one, but in the spirit of fairness and for the budget conscious, I picked up a Jolt at Target for about $5 or so. 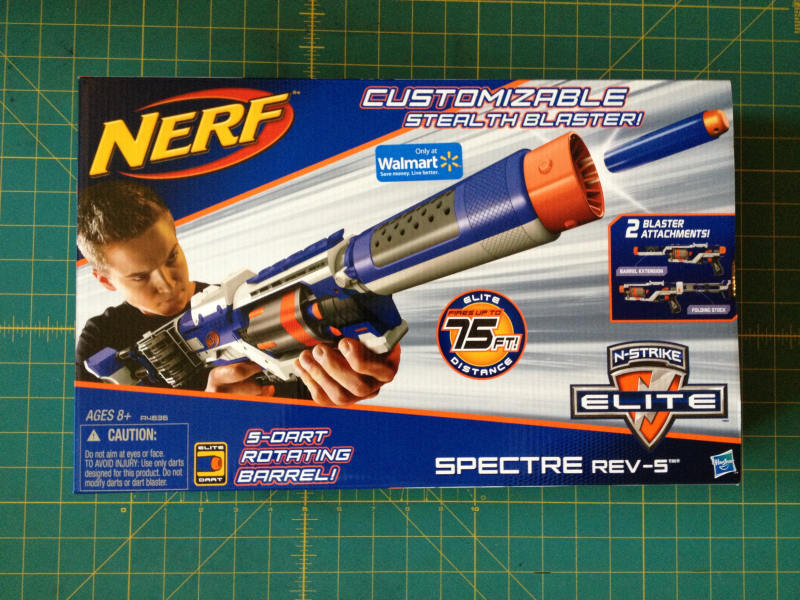 I don’t remember seeing it in the Nerf isle, but it was on the impulse rack at the register when I was leaving. So, if you want to pick one up, it could be located in either place depending on the specific Target store that you shop at. 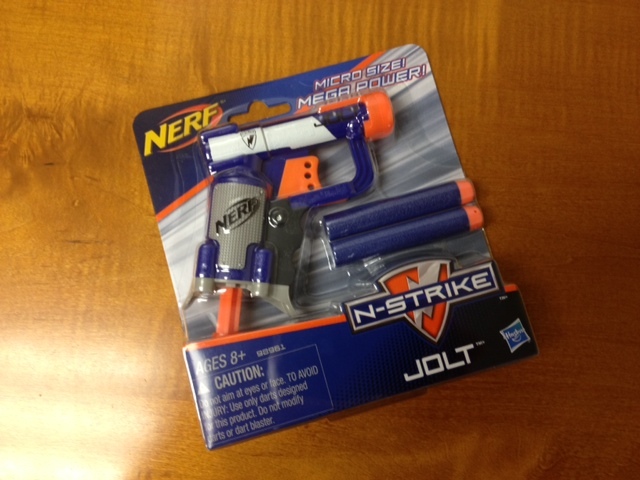 The Jolt can also be picked up at Kmart and Toy R Us stores as well. In my opinion, this blaster is a bit too small and underpowered, and I would have a hard time recommending it to someone. The Jolt comes in a blister pack that it can be easily removed from. 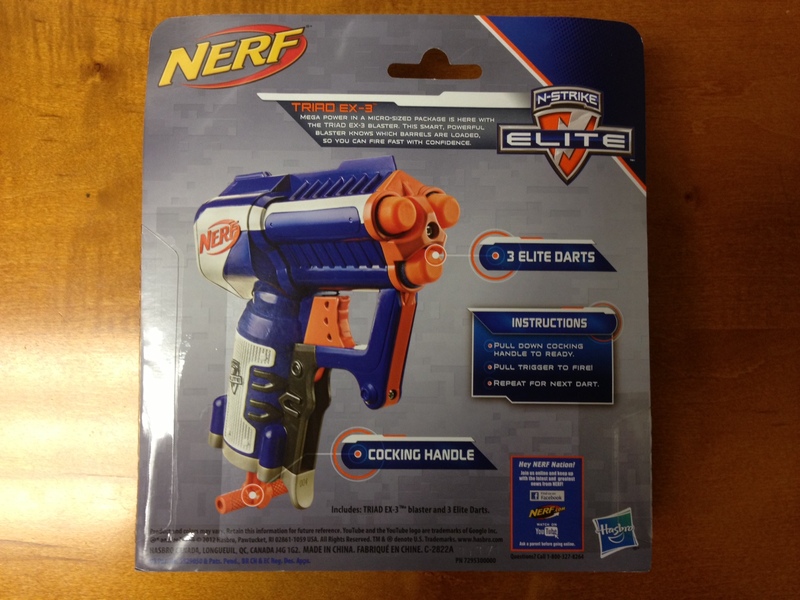 It comes with two Elite darts in the new package. If you find an older Jolt, (usually orange instead of the new blue and white color scheme,) it will be packaged with two whistler darts instead. If your office doesn’t have an ammo dump of darts to borrow from, I recommend that you purchase a small package of extra Elite or Whistler darts. Two darts will not be enough for a sustained firefight. The more darts the better, but even a refill pack of 12 Elite darts will only set you back five or six bucks and it’s a lot better than cowering in your cube after two shots, waiting for someone to return fire. 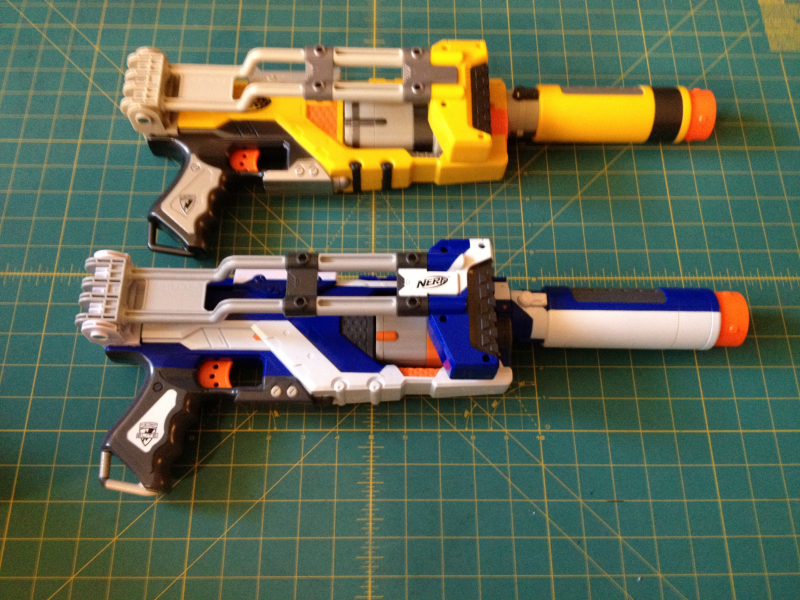 Jolt and Triad side-by-side comparison. 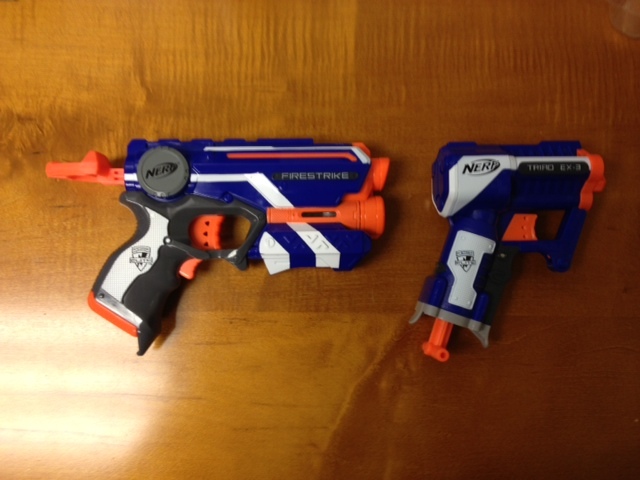 The Jolt is the smallest of the Nerf brand blasters on the market, which has its advantages as well as disadvantages. It’s small enough that you can fit it in almost any pocket. Someone with large hands can almost palm it. I have normal sized hands but some slight-of-hand experience, so I can casually palm it out of sight unless someone is actively looking for it. Now you see it… Now you don’t. The Jolt’s main disadvantage is the same as its main advantage. It is incredibly small. Most would argue that it’s uncomfortably so. Two of my fellow coworkers had these opinions – Captain Big Hands said, “Too tiny to use effectively.” & Princess Tiny Hands said, “Uncomfortable handle, and a little small.” So, please keep this in mind when/if you purchase a Jolt. To prime your blaster, just pull down cocking handle at the base of the blaster until it clicks and you are good to go. The trigger requires about as much pressure as you would expect. Suction dart effective range: Untested, but assume equal to Whistler dart ranges.